Prof. Ephraim Katzir, the fourth president of Israel and one of its greatest scientists, died on Saturday night after a long life full of achievement mixed with sorrow. He was cared for until his death at his home on the Weizmann Institute of Science campus in Rehovot. He was born in Kiev on May 16, 1916, to Yehuda, an accountant with fiercely Zionist ideals, and Tzila Katchalski. The couple lived in Lodj in Poland, where Ephraim's only sibling, Aharon, was born. However, the family moved to Kiev because of World War I. After migrating on to Bialystock, economic problems in the country and ideology induced the Katchalskis to make aliya in 1925. After graduating from Jerusalem's Rehavia Gymnasia high school, Ephraim enrolled at the Hebrew University of Jerusalem, where he studied botany, zoology and bacteriology before finally concentrating on biochemistry and organic chemistry. In 1941, he completed his doctoral thesis on simple synthetic polymers of amino acids and continued his education at the Brooklyn Polytechnic Institute and Columbia University, as well as Harvard University. While studying in Jerusalem he participated in the first noncommissioned officers' course given by the underground Hagana and later became intensively involved in the IDF's Science Corps (known as Hemed), which was founded when the War of Independence broke out. Working together, Aharon and Ephraim developed new types of explosives to supplement the Jewish paramilitary organization's precious store. But the product was so malodorous that they had to do their lab work in a cave in Jerusalem's Sanhedria quarter. "When I entered a bus, people used to run away because of the stinky smell. Only years later did we learn how to eliminate the smell from that material," Ephraim recalled. When the war ended, Ephraim and his brother, who was a very promising young chemist, joined the fledgling Weizmann Institute. Ephraim founded and headed the biophysics department, while Aharon was invited in 1948 by Chaim Weizmann to join the institute as head of the department of polymer research. Aharon became a professor of physical chemistry at the Hebrew University in 1952. 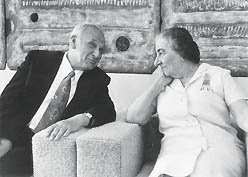 Their close relationship was tragically cut short when Aharon was among those murdered in the Lod Airport massacre by Japanese Red Army terrorists on May 30, 1972 - an event that broke his brother's heart. Ephraim Katzir's initial research centered on polyamino acids, which are synthetic models that facilitate the study of proteins. His pioneering studies contributed to the cracking of the genetic code, the production of synthetic antigens and clarification of the various steps of immune responses. The understanding of polyamino acid properties led, among other things, to a team of Weizmann scientists' development of Copaxone, a drug used worldwide to slow deterioration from multiple sclerosis. Another major success was in immobilizing enzymes. Katzir developed a method for binding enzymes, which speed up numerous chemical processes, to a variety of surfaces and molecules. The method laid the foundations for what is now called enzyme engineering, which plays an important part in the food and pharmaceutical industries. For example, it is used to produce fructose-enriched corn syrup and semi-synthetic penicillins. Later, he focused at Weizmann on polymers (large molecules composed of repeating structural units connected by covalent chemical bonds), specifically on immobilized enzymes and polyamino acids, which led to the development of synthetic antigens and the production of synthetic vaccines. One practical application of his work was his development of a synthetic fiber used to sew up internal wounds that dissolves in bodily enzymes. Katzir was always profoundly concerned with the social and educational aspects of science. He headed a government committee for the formulation of a national scientific policy, trained a generation of younger scientists, translated important material into Hebrew and helped to establish a popular, Hebrew-language science magazine. He served as chief scientist of the Defense Ministry and chairman of the Israel Society for the Advancement of Science, the Israel Biochemical Society, the National Council for Research and Development and the Council for the Advancement of Science Education. He also headed the National Biotechnology Council and was president of the World ORT Union. A long-time socialist, Katzir supported the Labor Party and was urged by prime minister Golda Meir in the spring of 1973 to present his candidacy for the presidency to succeed Zalman Shazar after her favorite for the job - Prof. Aharon Katchalski-Katzir - had been murdered. He later related that he didn't really know what a president was supposed to do, but he did recall that in 1952, when the first president Chaim Weizmann died, the post been offered to Albert Einstein (who turned it down). Powerful Labor Party finance minister Pinhas Sapir told the reluctant Katzir he would build him a lab at Beit Hanassi so he would not be separated from his beloved science during the five-year-term, but this never happened. He formally hebraicized his surname to Katzir ("harvest") when he became president, but he remained bashful in public and reluctant to give up his scientific research and teaching. In what was perhaps his most momentous meeting as president, he welcomed Egypt's president Anwar Sadat to Israel and Jerusalem in 1977. During his five years in office, he and his late wife, Nina, an English teacher by profession, paid special attention to the problems of society and education and were consistently eager to learn more about all sectors of the population. About four months after moving to Beit Hanassi, Katzir symbolically led the nation through the Yom Kippur War, with its horrific death toll, anti-government demonstrations, Meir's resignation and the appointment of Yitzhak Rabin to replace her. Katzir was well received at the White House by Richard Nixon and Gerald Ford. In 1977, the Likud defeated Labor and a new bipartisan era began. Beit Hanassi was the scene of talks with party heads and the president's symbolic request to try to establish a coalition. Katzir never had the charisma or gift for gab that some Israelis prefer in a leader; at dull ceremonial events, he surely was dreaming of his lab, microscopes and test tubes. He always smiled shyly and looked people in the eye when he shook their hand, but a veil of sadness seemed to hang in the background. In addition to the murder of his brother, his daughter Nurit died of carbon dioxide asphyxiation at 23 when she fell asleep at home without being aware of a burning kerosene stove and sealed windows; daughter Irit, a "sensitive poet," died at 43 in "tragic circumstances," and Katzir's wife, Nina, died of cancer 23 years ago. Their son Meir (a mathematics professor at the Technion-Israel Institute of Technology, who has three adult children) and Aharon's son, Prof. Abraham Katzir (an expert in infrared physics at Tel Aviv University) survive him. Upon completion of his term of office he returned to research at Weizmann and was named "institute professor," a prestigious title awarded by the Weizmann faculty and administration to outstanding scientists who made significant and meaningful contributions to science or to the State of Israel. He also devoted himself to the promotion of biotechnological research in Israel and founded the biotechnology department at Tel Aviv University. The creation of this department was a continuation of his efforts to establish science-based industries here. Katzir helped create several companies based on the fruits of his scientific research. In the later years of his scientific career, Katzir turned to new areas of research. In one project, he headed a team of Weizmann scientists that won an international contest on computer modeling of proteins. In another study, he was part of an interdisciplinary institute team that revealed an important aspect of the effects of snake venom on the body. Katzir authored hundreds of scientific papers and served on the editorial and advisory boards of numerous scientific journals. International scientific symposia were held in Rehovot and Jerusalem to celebrate his 60th, 70th and 80th birthdays. Into his 90s, Katzir's former students - leading professors themselves - came to his home where he was wheelchair bound and brought their scientific articles before publication so he could comment on them. Katzir was a member of the Israel Academy of Sciences and Humanities and of numerous other prestigious bodies in Israel and abroad, including the Royal Institution of Great Britain, the Royal Society of London, the US National Academy of Sciences, the Academie des Sciences in France, the Scientific Academy of Argentina and the World Academy of Art and Science. He was a visiting professor at Harvard University, Rockefeller University, the University of California at Los Angeles and Battelle Seattle Research Center. In addition, Katzir won the Rothschild and Israel prizes in natural sciences, the Weizmann Prize, the Linderstrom Land Gold Medal, the Hans Krebs Medal, the Tchernikhovski Prize for scientific translations, the Alpha Omega Achievement Medal and the Engineering Foundation's International Award in Enzyme Engineering. He was the first recipient of the Japan Prize and was appointed to France's Order of the Legion of Honor. The magazine Annual Reviews quoted Katzir as saying: "I have had the opportunity to devote much of my life to science. Yet my participation over the years in activities outside science has taught me there is life beyond the laboratory. "I have come to understand that if we hope to build a better world, we must be guided by the universal human values that emphasize the kinship of the human race - the sanctity of human life and freedom, peace between nations, honesty and truthfulness, regard for the rights of others, and love of one's fellows." At the age of 92 last year, Katzir completed a 362-page, Hebrew-language autobiography called Sipur Haim (A Life's Tale) - an apt reflection of his modest manner. The volume is packed with a mind-boggling cornucopia of people, dates, places, events and facts from as long as eight decades ago, and reflected the fact that his life had been intertwined with some of the most memorable events of the Jewish state and the Jewish people. "I believed with all my heart that science will bring peace to this country, renew its youthful vigor and create the sources for new life, both spiritually and materially," he wrote in a biological chemistry journal in 2005. "I have been lucky enough to spend my life in pursuit of my goals, with some success and considerable satisfaction." After he and his former biology student Amos Carmel, a journalist at Yediot Aharonot, completed the writing of his autobiography, Katzir told The Jerusalem Post: "I didn't take notes during my long career and didn't save any documents. Everything came from memory, with Amos's help. "I felt that before I meet the Almighty, I wanted to write a book my son and grandchildren could read and so that scientists will see that they can accomplish things outside scientific life as well."